The history of public welfare in the United States has been one of continuing change and growth. Prior to the 1900’s local governments shared with private charitable organizations major responsibility for public assistance or as it was often termed, “public relief.” As the nation’s economy became more industrial and the population more concentrated in urban areas, the need for public relief often grew beyond the means, and sometimes the willingness, of local public and private authorities to provide needed assistance. A Discussion of Public Relief: 1940This report was prepared by Anna Kempshall, Director of Family Service, and most likely to have been presented to the Board of Directors of the Community Service Society November 4, 1940. The subject of relief was very timely because a number of the New Deal programs enacted in 1935 created the nation’s first universal social safety net that included federal and state funding for financial grants to poor individuals and families. Aid for the Aged (OAA) 1935Title I of the 1935 Social Security Act created a program, called Old Age Assistance (OAA), which would give cash payments to poor elderly people, regardless of their work record. OAA provided for a federal match of state old-age assistance expenditures. Among other things, OAA is important in the history of long term care because it later spawned the Medicaid program, which has become the primary funding source for long term care today. Aid for the BlindTitle X of the Social Security Act of 1935 authorized federal funds to be distributed to the states for financial assistance to the needy blind residents of their state. The first authorization was for an appropriation of $3,000,000 for the fiscal year ending June 1936; and and there is hereby authorized to be appropriated for each fiscal year thereafter a sum sufficient to carry out the purposes of this title. Aid To Dependent Children: The Legal HistoryFor its first three decades, AFDC operated much like a private charity, with its case workers given discretion in investigating clients, cutting off benefits to those determined to be unsuitable, and reducing benefits to those found in violation of any of AFDC's myriad regulations. Starting in the mid-1960s the National Welfare Rights Organization, built primarily by African American women and functionally a part of the civil rights movement, began organizing to defend welfare recipients' rights. American Association of Public Welfare OfficialsIn 1930, as the financial depression progressed President Herbert Hoover appealed to the association to assist in developing public relief programs in the different states, counties and cities. Thus, the initial project of the new association was to help President Herbert Hoover’s Emergency Committee for Employment (later named the President's Organization for Unemployment Relief) in gathering information on the need for emergency public relief and to develop plans on how to meet those needs throughout the country. American Public Welfare AssociationBy John E. Hansan, Ph.D. At the 1929 annual meeting of the National Conference of Social Work in San Francisco a delegation of public agency representatives voted to organize a national membership organization open to all levels of government...Initially, the organization was named the American Association of Public Welfare Officials and its mission was to help and improve the activities of public welfare organizations throughout the nation. The name was changed in May 1932 to the American Public Welfare Association (APWA). Berry Picking and Relief (1935)Public relief affords no real security. The family on relief cannot meet its actual minimum needs. If private employment can offer more, we send it men. But we can hardly abandon our people to industry or agriculture which offers them less than relief. Employers will have no difficulty in getting or keeping labor if they can guarantee a certain and adequate wage and decent conditions. The relief client and his family are not lolling on the fat of the land on $7.50 a week. Care of the Aged PoorThe remedy for the real evil which the commission's report shows (such extreme dread of poverty as still remains) is, I believe, to be found in a continuance of our progress in making relief both sufficient and humane. We must entirely abolish the old idea, already largely abolished, of treating a dependent person as a pauper. The old practice, the old words, the old attitude, all constitute the evil which modern measures try to abolish. For the last six years I have stricken the word "pauper" from every one of our hundreds of departmental forms which has come up for reprinting. We need an amendment to our statutes which will entirely eliminate the word "pauper." It is an obsolete word except in the law. Case Work in the Administration of Public Relief: 1935 In your citation from the Mayor’s Committee on Unemployment Relief the statement occurs – “The one million men and women who are unemployed today in New York City as a result of the depression cannot be regarded as maladjusted individuals in need of case work.” This is another version of the old “worthy” and “unworthy” concept, which holds that ordinary poor are to be regarded as just maladjusted people who may be subjected to an unpleasant discipline called case work; but the new or worthy poor, or the poor “through no fault of their own” must be protected against this case work. Federal-State Public Welfare ProgramsThe Social Security Act of 1935 initially authorized federal financial participation in three state administered cash assistance programs: Title I: Grants to States for Old-Age Assistance (OAA); Title IV: Grants to States for Aid to Dependent Children (ADC); and Title X: Grants to States for Aid for the Blind (AB). The framers of the Act also recognized that certain groups of people had needs for particular services which cash assistance alone could not or should not provide. To meet these needs small formula grants for the states were authorized in relation to: Maternal and Child Health, Crippled Children, Child Welfare, and medical assistance for the aged. A fourth program of public assistance -- Aid to the Disabled (AD) -- was added in 1950. Forms Created to Combat "Social Evils"Among the Board of Public Welfare departments is the Recreation Department of the board which maintains supervision over all public dances in the city. Licenses must be secured for all such dances, and an inspector is present to see that dance hall rules are complied with. These rules bar the sale of liquor, provide that dance halls be properly lighted, forbid "shadow" and "moonlight" dancing, stipulate that all dances must close at twelve o'clock unless a special permit is secured, and provide that no girls under seventeen shall attend public dances unless attended by parent or guardian. Failure to comply with these rules results in a revocation of the dance permit. During the first year of inspection. more than 300 young girls were sent from dance halls and their parents notified. That inspection has resulted in raising the standard of the dances is attested by the owners of dance halls themselves. It has also increased instead of diminished the attendance at these dances. Similar permits were required for carnivals, pool halls and theaters. Functions and Services of the Kansas City Board of Public Welfare: 1910-1911This Article appeared in The Survey, December 16, 1911. The article describes the growth and development of the first public welfare department in the U.S. during its first two years of operation. At the time of its creation, Kansas City was among the nation's twenty largest cities with a population of 248,000 residents. Medicaid Program (circ. 1980)Medicaid (Title XIX of the Social Security Act) was created with little debate in 1965. Its purpose was to provide federal financial assistance (FFP) to states in providing health care for public welfare recipients. Similar to other state-federal public welfare program, states had to choose whether or not to participate in the Medicaid program. Model Ordinance This Model Ordinance was developed by Leroy Allen Halbert, General Superintendent of the Kansas City Board of Public Welfare for eight years. During that time, he helped formulate plans for how other cities, counties and states could organize their own Boards of Public Welfare. For example, in a presentation to officials in Topeka, Kansas in the Spring of 1912, he said: “…small towns could not afford to have a full time trained social worker and that the proper unit for handling welfare problems for the small communities was the county and urged that probation work, truancy work, relief work, etc. should all be concentrated in the hands of a good trained social worker.” This Model Ordinance as one of the tools he developed to assist in the creation of local departments of public welfare. Old Age Assistance: A Brief History (1934)At the end of 1928, after six years of agitation, there were only six states and one territory which had made provision for their aged. They were Colorado, Kentucky, Maryland, Montana, Nevada, Wisconsin and Alaska. All the state laws were of the optional type, i.e., they left the adoption or rejection of an old age assistance system to the discretion of the counties. For this reason these laws had very limited effect only. Old Age Assistance: An OverviewFrom the earliest colonial times, local villages and towns recognized an obligation to aid the needy when family effort and assistance provided by neighbors and friends were not sufficient. This aid was carried out through the poor relief system and almshouses or workhouses. Gradually, measures were adopted to provide aid on a more organized basis, usually through cash allowances to certain categories among the poor. Mothers’ pension laws, which made it possible for children without paternal support to live at home with their mothers rather than in institu­tions or foster homes, were adopted in a number of States even before World War I. In the mid-twenties, a few States began to experiment with old-age assistance and aid to the blind. Origins of the State and Federal Public Welfare Programs (1932 - 1935)The history of public welfare in the United States has been one of continuing change and growth. Prior to the 1900’s local governments shared with private charitable organizations major responsibility for public assistance or as it was often termed, “public relief.” As the nation’s economy became more industrial and the population more concentrated in urban areas, the need for public relief often grew beyond the means, and sometimes the willingness, of local public and private authorities to provide needed assistance. During the Progressive Era, some state governments began to assume more responsibility for helping the worthy poor. By 1926, forty states had established some type of public relief program for mothers with dependent children. A few states also provided cash assistance to needy elderly residents through old-age pensions. PolioPolio is caused by a virus; it affects the body by attacking the central nervous system, specifically those neurons essential for muscle activity. The first U.S. polio epidemic swept across the country in 1916, and then again in the late 1940s and 1950s. Public Assistance--Values and LacksThrough provisions in the public assistance titles of the Social Security Act, great progress has been made in fulfilling the obligation of government to secure and protect human rights. For the first time in the United States, the legal right of a needy person to public assistance was established for four groups. Requirements for approval of state assistance plans included: the right to apply for assistance and to have prompt action taken on the application, and if eligible, to receive unrestricted money payments for as long as needed, to have personal information kept confidential, except as required for administration of public assistance, and to have the right of appeal to a state agency and the courts if denied assistance by a local agency. These provisions were all intended to prevent discrimination and humiliation and to help recipients maintain or rebuild their independence. Public Relief in the Sit-Down Strike: 1937An Editorial in The Survey, March, 1937. "A sharp reminder that 'emergency' is the middle name of public relief agencies came home to the Genesee County, Mich. Welfare Relief Commission last month with the 'sit-down strike' in Flint of the United Automobile Workers." Public Welfare In The Democratic ProcessPresentation to the American Public Welfare Association Regional Meeting by Loula Dunn. "Public welfare is one way in which a basic principle of democracy finds practical application." Public Welfare: A System of Government Social WorkThe board of public welfare movement has behind it the dynamic of a great ideal which in a measure explains its history. The movement proclaims a practical Utopia to be realized by doing scientific social work on a large scale. This program is based on the idea that social science and social invention can revolutionize society. It accepts no misery as inevitable and no wrong as irremediable. It aims at a new social order. Since 1900, there has been a greater development along these lines than existed in the previous one hundred years. Miss Eva M. Marquis, superintendent of the research bureau of the Kansas City board, made a study of all the national organizations devoted to social betterment propaganda and social reform which she could find. She listed ninety, in all, and found that three-fourths of them had been organized since 1900. It is probably no exaggeration to say that the proportion of governmental activities for social welfare that have originated since 1900 would be almost the same. 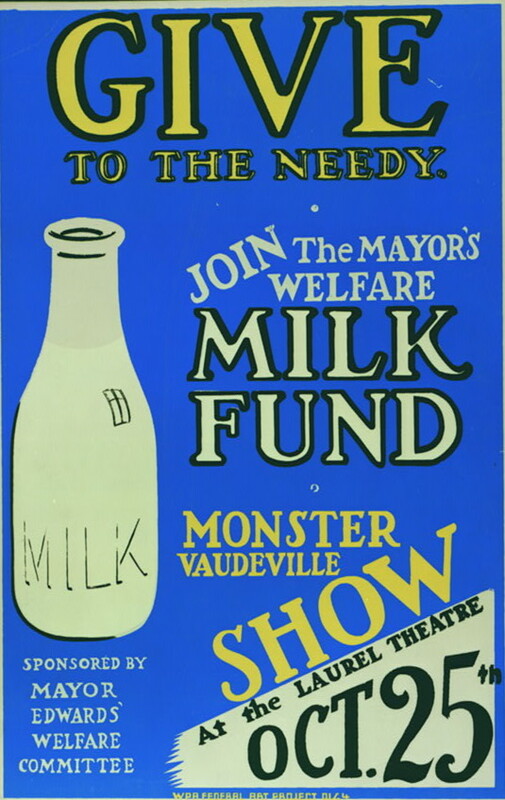 Public Welfare: Aid for Dependent ChildrenAid to Families with Dependent Children (AFDC) was established by the Social Security Act of 1935 as a grant program to enable states to provide cash welfare payments for needy children who had been deprived of parental support or care because their father or mother was absent from the home, incapacitated, deceased, or unemployed. Public Welfare: Food StampsThe food stamp program, started in 1965. It evolved from earlier federal efforts to distribute surplus food to needy people (e.g., commodities, such as beans, rice, peanut butter, etc. ). Major control over the food stamp program rests with the Agriculture Committees of Congress and it is financed and administered at the national level by the United Stated Department of Agriculture (USDA). Public Welfare: Model Constitution At the Forty-Fifth Annual Session of the National Conference of Social Work in 1918, Leroy A. Halbert, General Superintendent, Board of Public Welfare, Kansas City, Missouri, presented his views on: Boards Of Public Welfare: A System Of Government Social Work. In the course of his presentation he described an initiative he facilitated. Below is a paragraph from his presentation describing the work of the National Public Welfare League and a copy of the Model Constitution offered to prospective members. Report from Flint, Michigan, November 30, 1934What to me was of outstanding interest here is the way the unemployed are behaving about relief. The workers on the whole are "hard babies," the living conditions are bad, the struggle for existence has been terrible even before the depression, but the place is to a certain extent a yardstick of behavior in depressed, deflated conditions....I spent a day visiting homes with investigators. They tell me that relief is actually raising standards in some of these shack lives. One of the leading doctors told me that medical care in the City was now better than it had ever been before. In the homes that I visited less than 25 per cent were "unemployables." All, except a very few, asked for clothing or other articles such as a new stove, that neighbors had received from relief. I certainly had a feeling that few would choose to stay on relief but there was little feeling that it was a painful process to ask for relief. Report, Flint, Michigan, November 17, 1934As one investigator said, "The workers in Detroit used to run up debts between employment,--run a rent up for several months, owe a grocery bill for several months and borrow on the furniture. They don't do that any more. When their money is exhausted they come to relief." While several men said to me with evident satisfaction that they had no debts, others pointed out that the grocers and landlords no longer feeling so optimistic about the economic possibilities of their debtors will not extend credit as they used to. An old Ford worker said, "I used to be able to pick up odd jobs such as washing cars. My wife did, too, then. We used to worry along." A Chevrolet man said "Each year my savings grew lean and less until now I am at rock bottom." These men are both applying for relief for the first time this Fall. They expect to get jobs by the first of the year if not before. Southern Tenant Farmers' UnionThe Southern Tenant Farmers’ Union (STFU) was founded in Arkansas in 1934 by a group of socialism-inspired sharecroppers. The STFU was notably an interracial and gender-inclusive organization. They sought relief from the federal government for populations neglected by the New Deal’s agricultural policies, such as sharecroppers and tenant farmers. State-Federal Welfare RelationshipsThe Social Security Act of 1935 established the basic framework for what we know as the federal-state system of public welfare. Essentially, the Social Security Act established two sets of program designed to serve different purposes: (1) a national system of social insurance - or entitlements- for wage earners; and, (2) a system of state-federal public welfare programs for persons who were deemed destitute and unable to work for wages. To this day, the entitlement programs created by the Act, Unemployment Insurance and Old Age, Survivors, and Disability Insurance, form the bulwark of protection for the vast majority of wage earners and their families against the loss of income due to temporary unemployment, retirement, death or disability. For persons who were not then able to work, and therefore unlikely to become eligible for benefits under the wage-related social insurance programs, the Act authorized federal financial participation (FFP) in state administered cash assistance programs: Aid to the Aged, Aid to the Blind, and Aid to Dependent Children. The program of Aid to the Disabled was added in 1950. Supplemental Security IncomeThe federal and state governments now provide cash assistance to needy adults who are aged, blind, or disabled through the Supplemental Security Income (SSI) program. A person who is 65 years of age or older, legally blind, or permanently or totally disabled, and who meets prescribed income and resource requirements, can receive a basic federal cash grant of up to $264.70 per month. In FY 1981, some four million persons received SSI payments, amounting to $8.3 billion in state and federal funds. The states’ share, composed of mandatory and optional supplements, was approximately 22 percent, or $1.8 billion. The First Department of Public Welfare in the U.S.In 1909, the Mayor of Kansas City, Missouri appointed a body of prominent community leaders with experience in dealing with social problems in the city and asked them to visit large cities all over the country and learn what was being done in those cities to deal with poverty and the unemployed. From the findings of their reports and their own ideas about what to do, the commission then set out to devise a plan to create a new agency: The Kansas City Department of Public Welfare. Vermont Department of Public Welfare: 1927The public welfare department “concerns itself with the same classes of people as were herded together in public almshouses 100 years ago,” said the speaker. “There, in local almshouses and workhouses, combined usually with a pest house nearby, all of our modern problems could have been found in their beginnings. Chained in the garrets or imprisoned in barred rooms were the village idiots and simple women who would now be recognized as feeble‐minded. You Can't Pauperize ChildrenFirst let us review the past. Before the Social Security Act was passed, most of the states had what was called Mothers' Aid laws or Widows' Pensions. The effect of the Social Security Act was that the legislatures revised and broadened their laws because they had to comply with the more liberal provisions of the Social Security Act. The difference between the old laws for assistance to dependent children and the Social Security law is that in order to get the money, the assistance must be made statewide. In the past, the assistance was not statewide, and one city or county would give assistance here and there.